This weekend we had the great fortune of a 3 hour workshop for our school leaders with Jay McTighe. These opportunities always seem to have double the benefit since we not only get to develop our understanding with the help of a guest speaker, but also to have focused conversations with each other on specific areas of practice. McTighe’s area of expertise, Understanding by Design, is a great area of discovery and thought for us as a IB Continuum School. We began with a thoughtful discussion of the roles of acquisition (knowledge or skills), meaning making and transfer of learning. As we listened to McTighe’s descriptions of each there was a lot of agreement in the room as well as consensus both that all 3 play an important role and that transfer is the area we find most difficult to develop and support. One of the central focuses of our session together was the role and design of Essential Questions. Now certainly the idea of Essential Questions is not new, we were all starting with a good base of knowledge – but McTighe posed some thought provoking ideas and questions which in turn allowed us to have some meaningful discussions and reflections on our own practice. One of McTighe’s thinking points was the idea of using Essential Questions vertically, crossing grades to give depth, purpose and a sense of connectivity to learning. I’m not entirely sure where I stand on this right now. On the one hand I like the idea of bigger learning goals for students and sense of common purpose and connection in our learning. However, in practice I have some reservations I need to work through first. Primarily, I worry that these overarching questions become a distraction from working towards mastery for some students. We’d have to explore in much more depth how we connect these back to rigorous learning and authentic assessment before I’d be comfortable starting to work on what those questions should be with my colleagues. Connected to this I’m also concerned that it would risk adding another layer of goals to work towards. We’re an IB PYP school and also use Common Core. It’s taken time, effort and blood, sweat and tears from a lot of people, but I feel like we’re in a place where this works for students, teachers and families as a way to deliver learning experiences which are deep, inquiry driven, concept based, and give students and teachers agency, whilst also being rigorous and data supported (critically not data led, but supported). I’m not sure at this point that another goal to work towards would benefit our learners, or our teachers. This did however prompt a great discussion about the IB PYP Transdisciplinary Themes. These serve the same purpose as the overarching questions McTighe described. They given a vertical focus to, and reason for, learning. But I wonder how much our students recognise this? In the past we’ve worked to make the same unit different across grades in the name of avoiding repetition – but what if we planned Who We Are, for instance, vertically with intentional cross over? How does what Grade 1 learn build into Grade 2’s focus? Another great point of discussion centered on our current use of the Lines of Inquiry and Teacher Questions. Why are they only Teacher Questions? Why aren’t they Essential Questions for students and teachers to consider as they build their understanding of the Central Idea? They’re already concept based, they are perfectly placed to be revamped and given a new role. As such McTighe shared some excellent resources (I believe you can view/purchase them through his website) on designing Essential Questions. I really believe this is an area where we can make a meaningful and impactful change which will support our students. How can we leverage the Transdisciplinary Themes to help students make deep and meaningful understandings across grades? Can we design Essential Questions which work towards our Central Idea using the Key Concepts? I’m excited to see what my colleagues come up with when we undertake this process together! A huge thank you to our school, AIS Kuwait, for continuously striving to provide us opportunities such as these (even on weekends which none of us grumbled about at all… well, maybe just a little at the start!). And of course thank you to Jay McTighe – in our 3 hour session he proved to be a very engaging presenter and gave us plenty to think about! What do different stakeholders think teacher agency looks like? How can we authentically increase teacher agency in our schools? Does this look the same across a continuum school? What actions need to be taken from an organisational/individual perspective? How might I support my teachers to develop their own sense of agency? Can you/should you ‘make’ a teacher develop agency? Or, what is the role and influence of teacher buy-in? What opportunities are there for collective/individual actions? How do we/can we model teacher agency to students? What role might this play in supporting student agency? As I think through these questions (which invariably have complex/multifaceted answers) I’m beginning to think of actions I can take in my role that will be supportive of teachers but not simply adding ‘extra work’ to their pile. 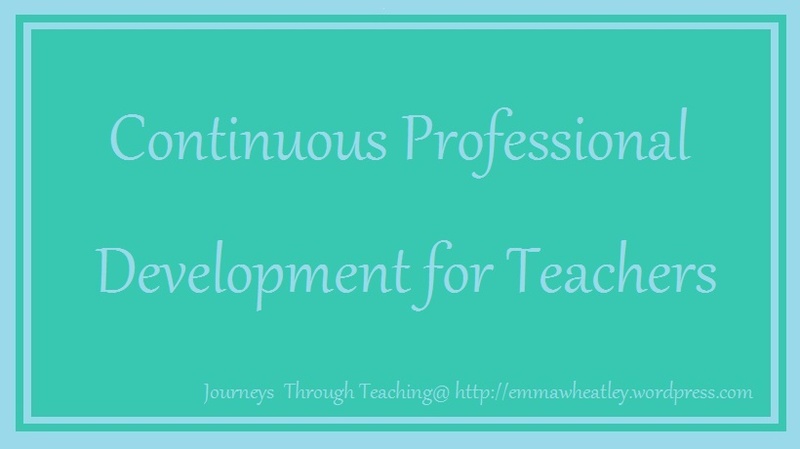 One area I chose to think about was CPD or Continuous Professional Development. Our school places a strong emphasis on teacher development opportunities with differing degrees of success and impact. – A CPD challenge, in which staff have a wide range of options for mini-CPD to try out on their own. There are a lot of options available, each learning opportunity is relatively short, and teachers choose when to do each one. The idea is to put teachers firmly in change of their own learning, whilst also providing suggestions on where to focus. This is still very much a work in progress and I’m trying to learn more as I grow; to learn more and think more about ways to increase teacher agency in the way we learn as professionals, yet balance this against the need for some direction. As we complete some of these new options (staff led workshops and the challenge especially) I’ll be seeking feedback from teachers at my school to see how this shapes my learning too! Recently at school we’ve been talking a lot about culture building. The need to build strong relationships in our classrooms is always a major focus for educators at the beginning of a school year, and for good reason. I’ve also been talking to others at our school about how we support a positive staff culture. Those conversations are, as always, ongoing and complex, but recently I saw a heartwarming example of building a learning culture that I wanted to write about today. Our son, Kiran, is 4. He loves Lego, and has been thrilled that one of his friends loves Lego too and they’ll often take turns visiting each others houses to play after school. One day last week I came home to find Kiran and his friend busy playing together (not too unusual), but they were so absorbed in what they were doing that I got chance to just listen to them play. And I heard something awesome. The 2 little boys were busily building some kind of vehicle, a ‘lair’ for bad guys, a hide out and goodness knows what else. But what amazed me was the way that they were taking turns and building on each others’ ideas. One of them would add something and describe what it was/its purpose “If we put a door here the bad guys can escape through it” – cute! Then, the other would look, agree and reply with “What if then…” and add their own idea. It was great to watch, they were quite happily building forward. Each idea didn’t need to be scrutinised too much, nothing they did brought this little game to an end, there was no final product, they just kept moving forwards – together. It was so simple, and yet so effective. Now, sadly, the world is a little more complex than Lego (although seeing some Lego kits recently makes me rethink that statement), and I myself am a strong advocate of working towards a clear aim… but watching their exchange made me consider how we could recognise and honour times when building forwards together was most valuable. If that approach of seeing a constant stream of problems and solutions as progress was actually incredibly useful. And if maybe their way of removing limitations and just seeing possibilities was one we all need more of. We all know the power of positive talk but how many of us check the way we talk to each other? How much time do we really spend considering how the way we say something can impact what happens next (think about ‘the power of might’ and how much difference 1 small word can make)? And do we take time to consider our responses when someone else raises a problem they are facing – do we respond in a way which encourages finding solutions? This week I began my new position as IB PYP Coordinator at AIS Kuwait. One of the most important (but also potentially most challenging) things I am working on during our Orientation Week is some staff training sessions. When I first started to think about what I should be covering in these I wondered how I’d fill the time, then quickly realised that actually the challenge would be deciding which things would have to wait until later in the year! There’s a few reasons for this, firstly I’m acutely aware that teachers need this time at the beginning of the year to prepare for all that’s to come. Secondly, I’m not sure I can guarantee that any of us would be ready to respond positively to long CPD sessions about using data to support instruction and differentiation in the week before school begins. Thirdly, I need time to build relationships and trust in my new role. Also, whilst we have so much great practice evident in our school, we’re also always striving to move forward and find new ways to challenge ourselves to keep moving forward. With this in mind I began prioritising which things we needed to do before school began. Some answers were easy: talk about classroom expectations (more about those another time); plan for the first week; give teachers new to the PYP a crash course to get them started. But one thing I kept coming back to is the way we use the Learner Profile, specifically how to use it to build community and promote learning both in and, critically, beyond school. Our school is in a position (likely not unique) in which the parents of our students experienced a vastly different style of education to that which we provide. We’re also a large school with 7 form entry across our Elementary School. This raises some interesting questions for me. How do we use the Learner Profile to promote shared values and community in school, beyond the walls of the classroom? Can it help us connect with our students families to support parents as their child develops as an IB learner? Can it offer us a way to promote a culture of Life Long Learning which is sustainable? Beyond the great learning in our classrooms, what connections can we make to the Learner Profile to show students the value of these attributes in the ‘real world’? How do we help our students connect to the Learner Profile? As an established IB school we’re fortunate to have a great blend of experienced voices and new perspectives when we consider ways to use the Learner Profile. As we move forward through the year I’m excited to see where we’ll take this next. What ways can we find to leverage the LP to develop a stronger sense of school community, identity and agency? Next week I begin my next post-grad course at The University of Nottingham, I’m taking their relatively new PGCEi course. It’s similar to the regular British PGCE (Post-Graduate Certificate of Education) only it’s mostly delivered via distance learning as is specifically designed for those of us working in international education. I have a week long face-to-face course next week followed by just under a year of distance learning. I’m excited to begin the course because as a teacher I love to be able to challenge myself to improve in all areas of my practice, keep up to date with developments in both practice and theory and develop as a person too. It’s also a subject that comes up a lot when I talk to other teachers, I think it’s a profession were many of us strive to find opportunities to develop and luckily we have many avenues open to us. Most schools of course provide some form of CPD but today I’m going to talk a little more about things we can do independently. This is not intended to be a comprehensive review of every CPD option (that would take far, far too long), however I’m hoping to talk about a few options I’ve used myself. I’ve also not written about formal teaching qualifications and certificates as these require a lot of research and individual considerations based on your own circumstances. So here’s a brief round up of a some options for pursuing your own professional development – good luck!